How exciting is this? I was shocked that when I opened the box, the Sim-Vivo pad was much bigger than I previously imagined. Seeing the pictures floating around on social media were definitely fooling me into thinking the actual item was much, much smaller. It’s about the size of an iPad Air! As soon as I opened the box, I found papers and a brochure with a plethora of supplies hiding underneath. There’s literally nothing else needed to start practicing on this suture pad! The coolest thing about Sim-Vivo is that all of their training tutorials are online! 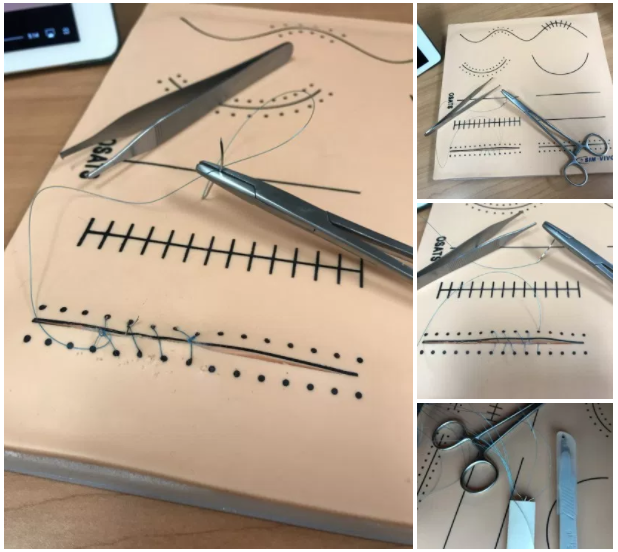 I have never practiced suturing before, but I do have a background in sewing cloth! When suturing faux or real skin, it’s a totally different technique and the feel of it is a world of a difference compared to sewing cloth. Do not compare the two! Above, you’ll find the Sim-Vivo brochure that was included. It explains what contents are included in the box and there’s also info about other kits that Sim-Vivo has available. They have also left all the information needed to reach out to them via social media, phone, or email. FYI, they’re very active on Instagram and I enjoy seeing what they’re always up to! Hint: they do a lot of giveaways, so make sure you follow them on Instagram: @simvivomedical. The above screenshot was viewed on my ipad, which is perfect for watching the tutorial videos. 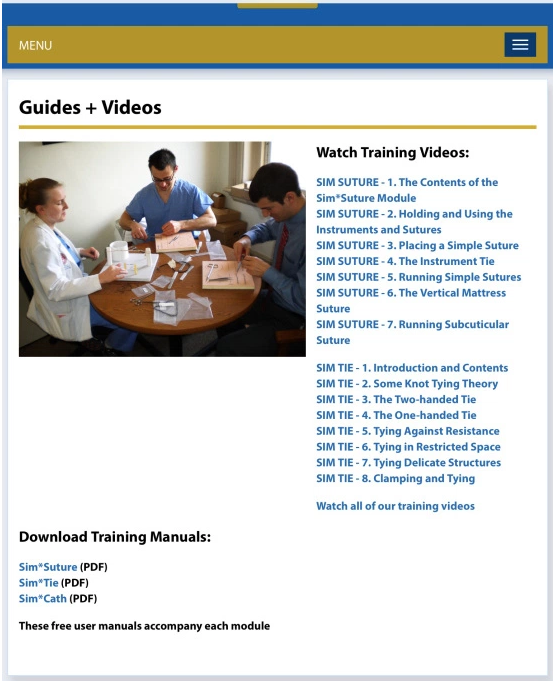 On that page, you will find all the currently available tutorial videos for Sim-Suture and Sim-Tie. There’s also downloadable PDF training manuals. The videos were so simple and clear even for someone who has never done suturing before. I took the kit with me to school to practice on during spare time in class and it turned a lot of heads in class! Peers were asking me, “do we have to learn that in class? !” They were shocked I mastered the different techniques of suturing right there in front of them! This is definitely a kit you will want to have on-hand to practice with especially before everyone in your class start discussing the topic and they get ahead of you in class. This is your ticket to practicing early and mastering those skills before your class even has the chance to do so! I am a nursing student and was told that nurses do not do suturing unless they are in the E.R. It is mostly the doctors that do suturing. If I can suture as a nursing student when my program does not even plan to discuss suturing, so can you. It is as simple as that. The tutorial videos will not let you down! Sim-Vivo really outdid themselves when they provided different lines and curves to cut on and suture back together on this suture pad! Under the faux skin, there is a squishy foam like foam-rubber bedding. A thick plastic board lines the bottom of the pad, accompanied with 4 non-skid pads in the corners to keep it from sliding around on any surface. The board arrives without any cuts on it which is great because Sim-Vivo has supplied the kit with incision knives to introduce you to cutting open faux skin and then sewing it back together. In real life as a doctor, you would have to know how to cut real skin open and sew it back together after the procedure is complete. Look at those tools! Sim-Vivo even as far as to have their brand name engraved into each tool piece. So fancy! All items are great quality. I was impressed with how heavy the scissors and forceps were and how sharp those knives were! If you look closely, you will notice that there is a measuring ruler on the side of those knives. Genius! Those tweezers are definetly not your mom’s average tweezers! They have teeth that grip the faux skin on the Sim-Vivo pad as if it were real skin. Those tweezers will be your best friend when suturing! Sim-Vivo supplied thread in 3 different sizes. You’re going to love this: each needle is already attached to a piece of thread so you do not need to do any threading or connecting thread to a needle! The work is all done for you! I have never seen anything like it before. All the needles are curved for easier suturing. Note the ipad in the middle picture! Even the tutorial videos show you exactly which tool to use and when. Ugh, it was so easy! Definitely proud of myself for mastering this skill! Not bad, right? I will definitely be practicing more often with this kit throughout nursing school because I do want to work in the E.R. when I graduate. 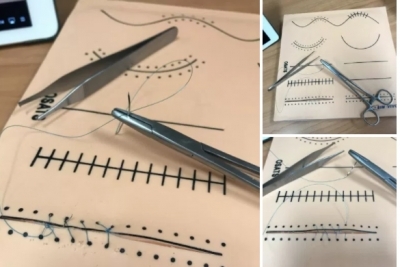 One skill that would definitely make my resume sparkle is this suturing skill. You cannot go wrong there! I can always brush up on my skills with this suture kit later on even it’s been a while since I have sutured anything. This kit was fun and easy to work with. Sim-Vivo supplies the tutorial videos free of charge on their website. If you run out of thread or need other supplies, obviously those things cost extra. The question: is it worth it? Absolutely. 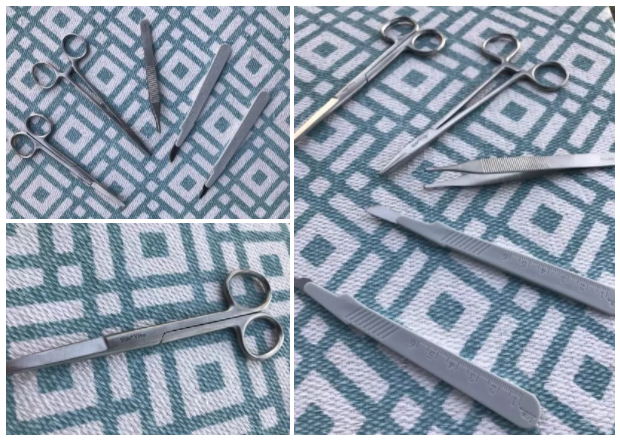 You will not find anything out there that supplies the suturing pad with supplies and thorough tutorial videos. Like hello, what are you waiting for?! Hurry up and get one before they sell out! Thank you, Sim-Vivo for sending me a suture kit to review. It’s been an awesome experience for me to learn a new skill! I hope I get to work with you guys again soon!